1. To press the tofu, wrap in kitchen paper, or a clean tea towel, add a board & weights on top of the tofu so that the water is squeezed out & the tofu is dry to touch. 2. Make the marinade in a medium baking dish by mixing together the marinade ingredients. Add the cubed tofu & mix the tofu into the marinade. Cover the bowl & chill in the fridge for a minimum of 2 hours. 3. Preheat the oven to 200c (180 fan), 400f, gas mark 6. Uncover the baking dish & bake the marinated tofu & sauce for 15-20 minutes. Allow to cool. 4. 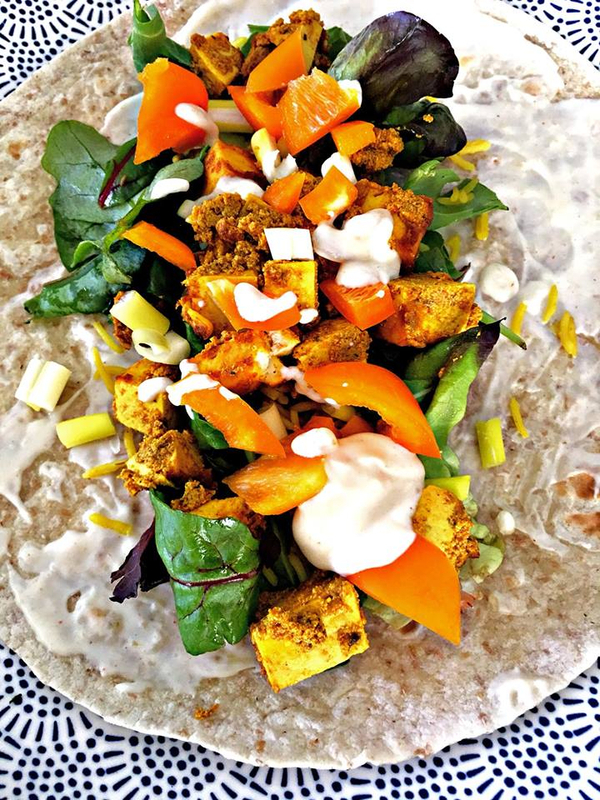 In a small bowl mix together the mango chutney & soya yogurt for the wrap & spread it over one side of the wrap. Add the remaining ingredients & a quarter of the baked tikka tofu. Roll & serve immediately or wrap with foil & store in the fridge until required. Repeat for up to 4 prepared wraps.